Making Brine for Chicken That's Tasty, Tender and Juicy! 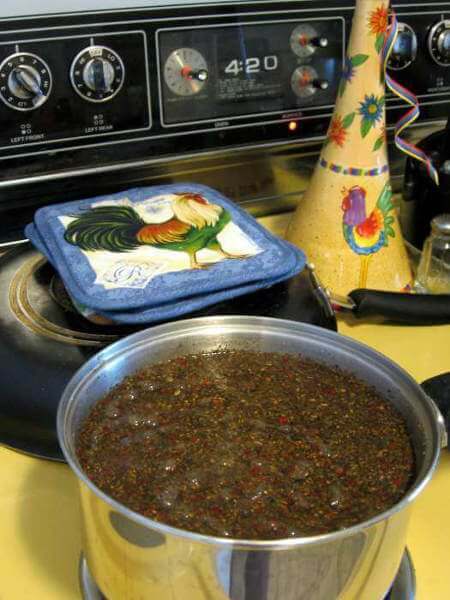 One way of making brine is to add the ingredients to a sauce pan, gently bringing them to a low simmer. This technique is especially good to use when whole fresh or dried herbs are in the brine recipe. The simmering action pulls flavors out of those seasonings that would otherwise remain locked up. It's important that the brine is cooled quickly after it's done simmering. The brine shown on this page was made from a recipe that included salt, molasses for sweetness and flavor, black pepper, red chili pepper flakes, garlic powder and onion powder. In addition to releasing flavors, simmering breaks the salt down to the smallest possible particles, which makes the brine much more effective at modifying the flesh of the chicken. The smaller particles can be absorbed into the chicken much easier and deeper. 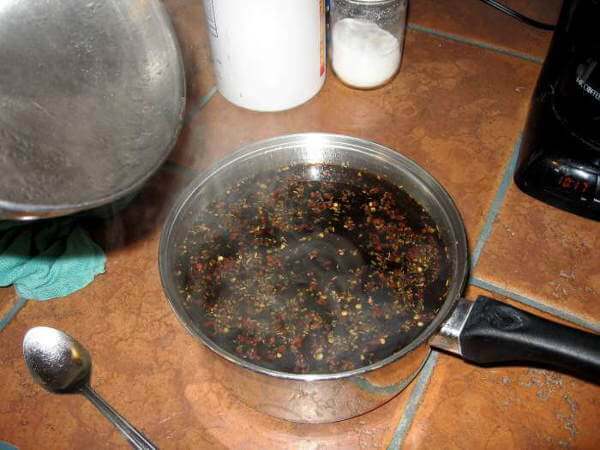 With this method only a portion of the water called for is used to simmer the spices and herbs. If the recipe calls for 4 quarts of water, simmer the spices in 2 quarts. 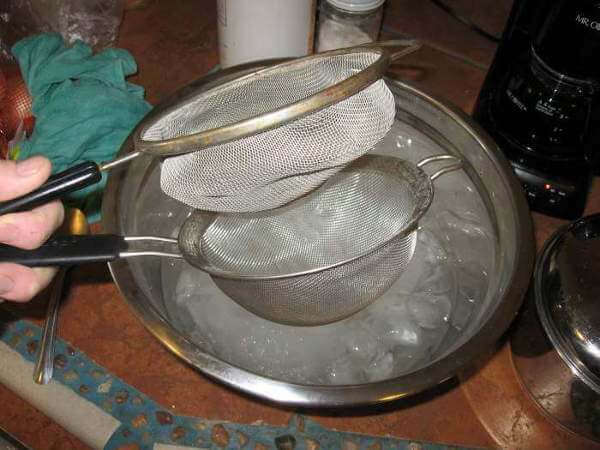 To find the correct amount of water and ice to use, add 2 quarts of water to the brining container and mark the level. Remove the water and fill with ice up to that mark, then add water up to the mark. If the recipe includes any liquids other than water, like fruit juices, wine or beer, there may not be room for ice. In that case, make sure those liquids are well chilled. Here's the chicken brine after simmering for 10 minutes on the stove. I removed it from the heat to start cooling as I prepared the next step. 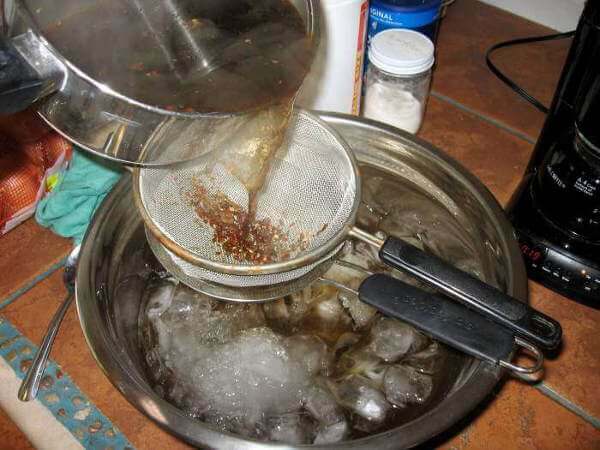 It's not necessary, but I usually strain the larger pieces of herbs and spices out of the brine using a double strainer setup, as shown here. Once the brine hits the ice, it'll cool down quickly. The brine has to be at or below 40 degrees Fahrenheit. If it's any warmer than that when the chicken goes in, bacteria can start to get a foothold...something you do not want to happen! Now the chicken breasts go into the ice cold brine. You can see that there are still a few ice cubes remaining in the brine, which is a good sign that it's cold enough. If the brine isn't cooled to 40 degrees or less after adding the simmered brine to the remaining liquids and ice it'll need to be refrigerated before adding the chicken. 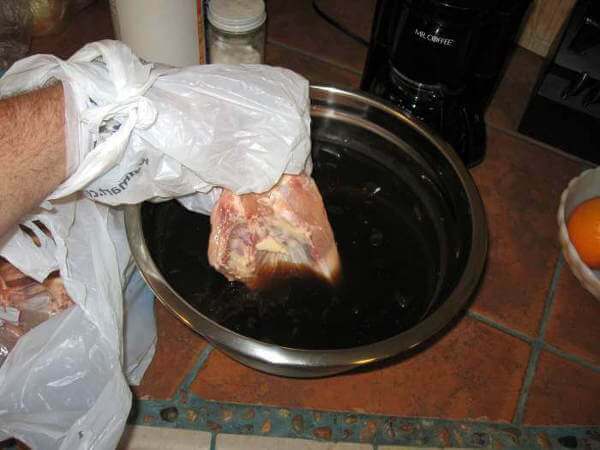 Continue reading for more tips on brining chicken. Time to Smoke That Brined Chicken! Now that the chicken has been brined, you know it's going to taste great! The brining process added flavor, and the moistness of the smoked chicken will be greatly improved. For tips on smoking whole chickens and chicken breasts, take a look at the following pages.